N'DahAhki is a nonprofit organization dedicated to educating the public about Native issues and concerns as well as serving as a resource and communications network among Native/Indigenous Peoples and their allies everywhere. The word `N'DahAhKi,' pronounced En DAH kee, is short for N'DahAhKiNaNa, a Mohican word that translates to `Our Ancient Heartland'. The Meeting Place is designed to be a communication area. Our bulletin board is there with schedules of upcoming events, featured news items, and special alerts about issues needing immediate action. There also you can email us with questions and comments. 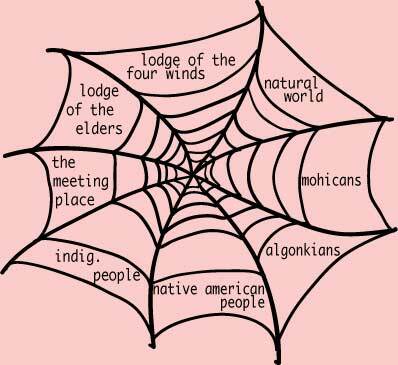 The Lodge of the Elders is a source for Native/Indigenous wisdom: a number of important principles such as the oneness of all and the importance of the environment. The Lodge of the Four Winds is a place for learning and includes texts on a number of subjects of interest to Native and Natural peoples, including resources for hands-on exploration and opportunities for face-to-face exchange. The Natural World is included as an integral part of the Native world; in fact, the two are the same. The Original People did not control the environment, they did not study the environment, they were an integral part of the environment. Although mainstream Western culture has alienated itself from Our Mother, this section will be concerned first with the specific and the local- in this case, Mohican Country- and with time this section will expand to the regional level, then to the global. All One Earth. All One People. This section is concerned with the Mohican Indian Nation. This organization originates from members of the Mohican Indian Nation, and has a significant connection with them. This section is about the Algonkians, a family of Native American nations, to which the Mohican Tribes are part. Covering the rest of the residents and tribes of the Americas whom were present before colonialization by European peoples. This section presents information about all Indigenous people throughout the world. In spite of- or because of- the great wealth and technologies that so affect the earth today, all beings are in great trouble. We are not only at the crossroads of human history, we are at the crossroads of earth history. There have been five major extinctions of species in the history of our planet. Today we are in the middle of the sixth. Virtually all the terrible sufferings going on in the world today are due to one species: our own. We featherless bipeds have achieved great power that we are not worthy of. We are like a ten-year-old child with a chemistry set: old enough to get into serious trouble but not old enough to be fully responsible for our actions. The fate of the world is in our hands now. We can create a place of good or we can create a wasteland. It is our belief that a great part of the world's troubles are due to the loss or abandonment of Indigenous values; that is, those ways of being that treat all living things as members of one great family. Life is about the relationship of all things to all things; in our human haste to acquire and hoard wealth and power, we have forgotten that we are a part of the whole. By wantonly destroying other beings, we have been destroying parts of ourselves. Even now many people do not seem to understand this fundamental truth. By promoting the interests of Native/Indigenous peoples and the values of the Old Ways, we at EnDahKee believe that we are contributing to the healing forces of the earth. Awareness of the Original People, their joys and sufferings, and their relationship to the land help make us aware of our common humanity and the need to return to the basics. We are not an exclusive organization; in fact, we invite all to join us. Everyone has something to contribute. Look, learn and tell us where your energies lie. And let us, as the Old Ones say, put our hearts and minds together and see what kind of future we can make for our children. Thanks to Pat Hughes, Jake Al, Don Rugenstein, and especially Adam Bloomston.